Here’s my scrap goodie bag giveaway! Cup cozy giveaway is here. Feel free to enter both. Sorry, giveaways are all done. 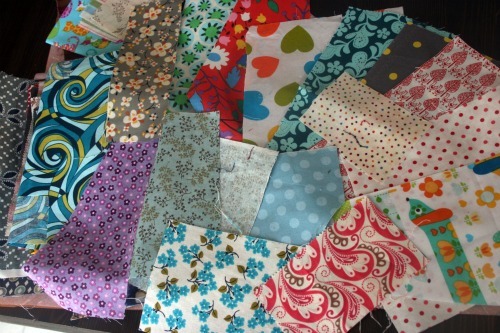 One lucky winner will get 10 ounces of fun scraps from my stash! I’m sure I’ll toss in some other fun goodies too. Picture below is just a random scrap photo I had, actual scraps will vary. Leave a comment and good luck! This entry was posted in scraps, sewing and tagged giveaway day, scraps, sew mama sew. Bookmark the permalink. I love scraps! So many beautiful colours and fabrics! Thanks for the great giveaway! You have some great “scraps” to share! Thanks and Merry Christmas! Wowee I love scraps, I already have loads but someone elses are always welcome. I’ve participated in a few scrap swaps and I love using other peoples scraps in my work it makes it that little bit more special! Thanks so much for the chance to win. Oooh! Other people’s scraps are my favourite! Thanks for the chance!